One of the our main focuses is getting more people on campus to recycle. There are recycling bins available, just be on the lookout for the large blue bins in the Fens, Java City, and around the main campus. On the residence campus, each dorm has a recycling bin for paper, and one for bottles and cans on the first floor. We cannot have recycling on every floor yet due to union and fire codes. Please talk to your hall council recycling representative, hall council president, or us about how to help your hall recycle more. 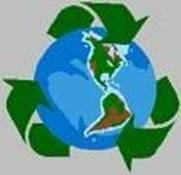 The large recycling bins are taken out each Wednesday for pick-up and returned on Thursday. Also, a lot of things can be recycled!!! Paper, magazines, cardboard (but not greasy pizza boxes, etc. as of yet). Most packaging can be recycled, especially plastics. Please make sure that you rinse out any bottles or cans your are recycling so the campus can stay clean and rodent-free. If you have more questions, send us an email or come to a meeting, we�d be happy to answer your questions or hear any suggestions you might have. Pay attention to leaving lights and TVs on, it will help the environment and be good practice for when you have to pay your own electricity bills. Don�t take really long showers or leave the water running constantly while you�re brushing your teeth or washing dishes. Get a tub for your dishes and fill it up with hot water to wash them, rather than let the water run for half an hour. Try doing little things, like bringing a canvas bag to the grocery store so you don�t use the plastic ones. Use a travel mug or water bottle instead of the paper cups at Java City and the Fens. We hope this helps, feel free to come to our meetings or contact us with any other questions or suggestions. Find helpful information below about Simmons and how to help the environment.